One of the easiest ways to create new business is to prospect for new work in your existing customer base. 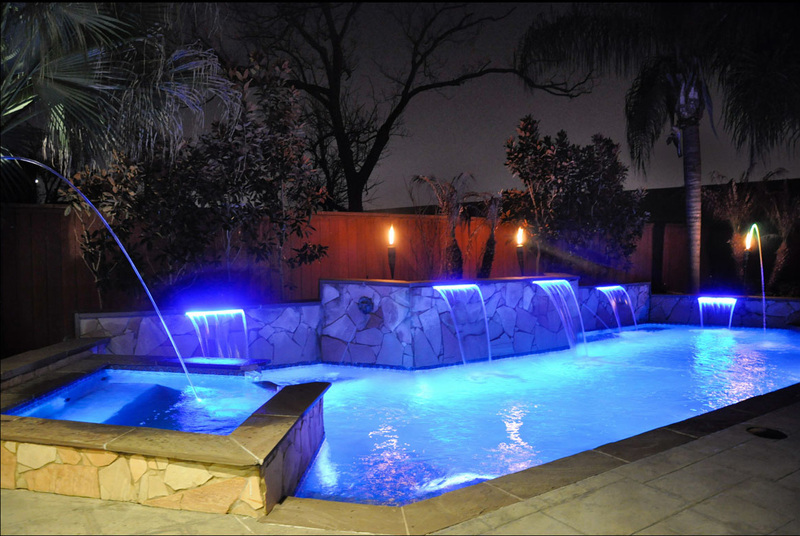 For landscapers, hardscapers and poolscapers, getting a past customer to contract a new project can be very profitable, and there are other advantages. For example, this is one of the rare times the contractor gets to pick the client, instead of the other way around. I go through my customer base and choose past clients who are easy to work with, can afford a new project, and would be interested in what I have to offer. If I choose wisely, my client benefits as well. He or she knows me and my work (and my boys and my dog) and trusts me to do the right job for the right price, no “new contractor blues”, no surprises. The key, then, is to find an attractive and desirable project that has a high perceived value and a high potential for profit, with little risk and minimal disruption to existing infrastructure. 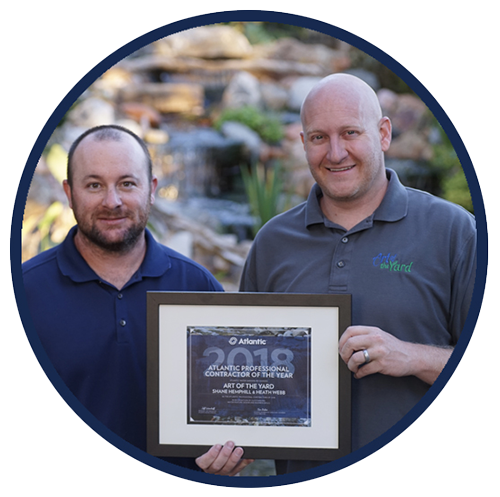 According to the American Society of Landscape Architects, who poll their members every year to determine market trends, Water Features consistently make their ‘Top Ten’ desired enhancements list year after year, although the type of water feature may vary from year to year. 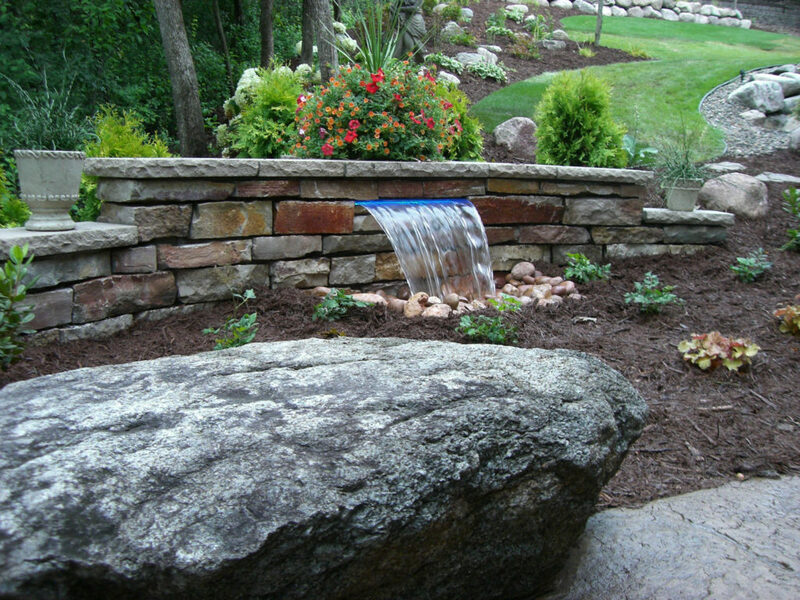 Currently, Hardscape water features are very popular, and that puts all those customers squarely in our sights. 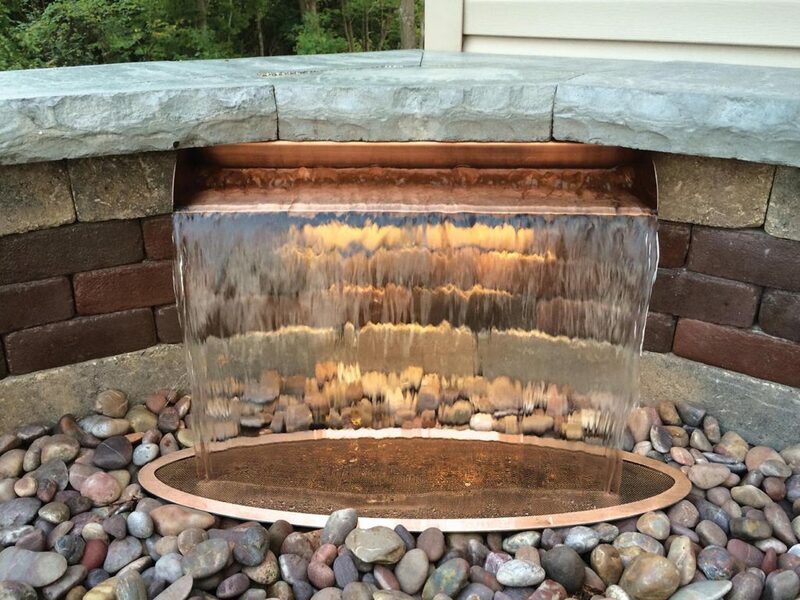 Many contractors already know that Atlantic’s Formal Spillways offer great visual impact, ease of installation and plenty of margin. What most do not know (yet) is that the Wall Spouts, Spillways and Colorfalls, and the Basins that complement them, were specifically designed not just for new work, but to upgrade pre-existing walls as well. 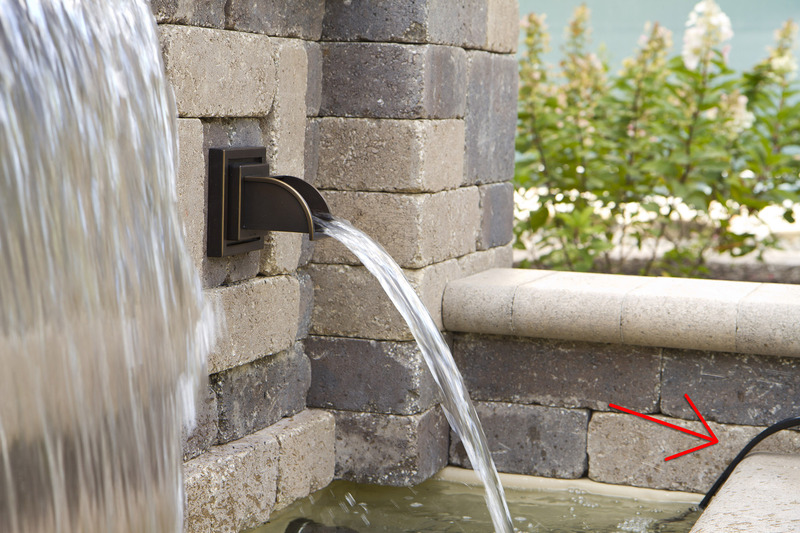 Stainless Steel Spillways are exactly 4” tall by 12”, 24” or 36” long, to replace an even number of engineered wallstone. 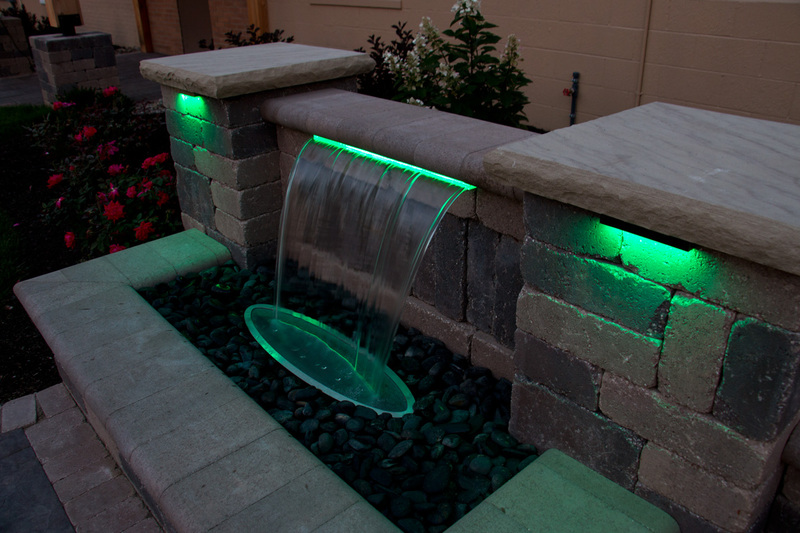 Colorfalls illuminated sheer descents drop into a simple-to-cut profile just under the cap of the wall. Solid brass Wall Spouts install from the front, threading directly onto 1-1/2” MIPT schedule 40 fittings. 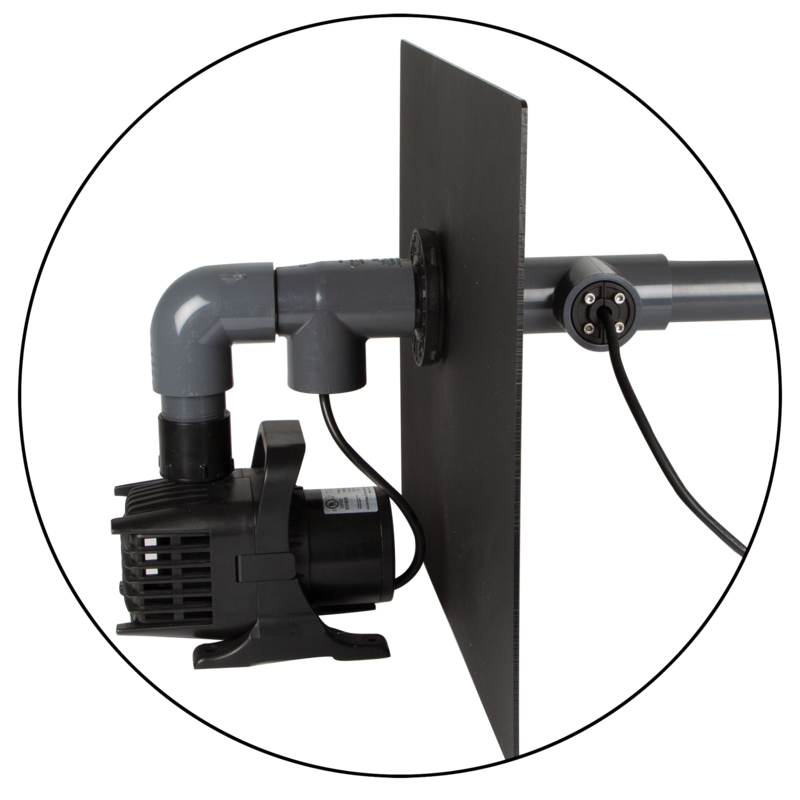 Choose the Spillway, Colorfalls or Wall Spout(s) and the appropriate Basin Kit, which contains everything needed for the installation – except the water ?. Determine where the feature will be located, and whether you want the Basin snugged up against the wall sitting at grade level or completely concealed underground. Compact the soil under the basin, then figure out how to pass the included 1-1/2” flexible PVC either under or through the vertical wall. Depending on the depth and the wall construction, a 2” hole may need to be drilled. Plumb the pipe to the Basin using the included fittings and install the pump in the Basin. Remove the top course or cap directly above the basin, wide enough for your Spillway or Colorfalls, or drill a 2” hole for each Spout. 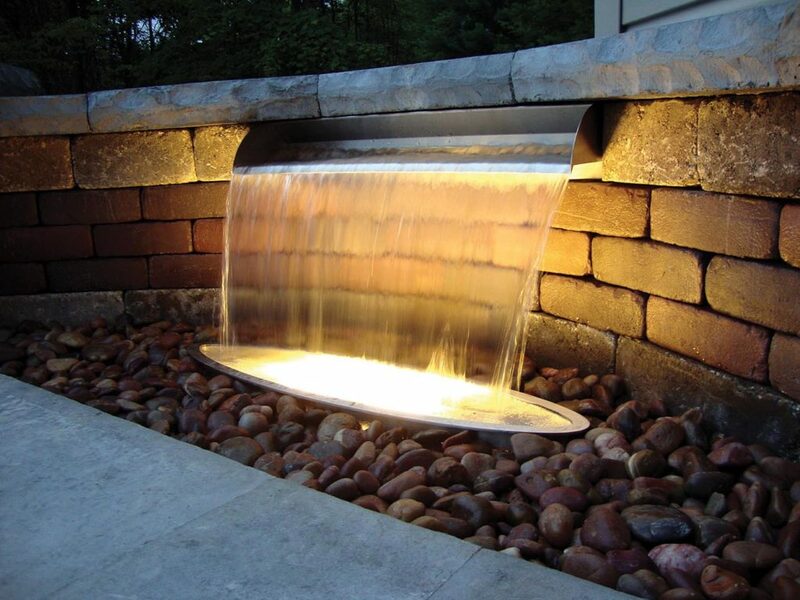 Install the spillway or Spouts following the instructions and replace the cap, caulking rather than cementing or gluing the stones above the spillway to provide access for future maintenance. Fill up and plug in. If the Basin is set at grade in front of the wall, hide it with a 16″ high wall of the same or contrasting stone. 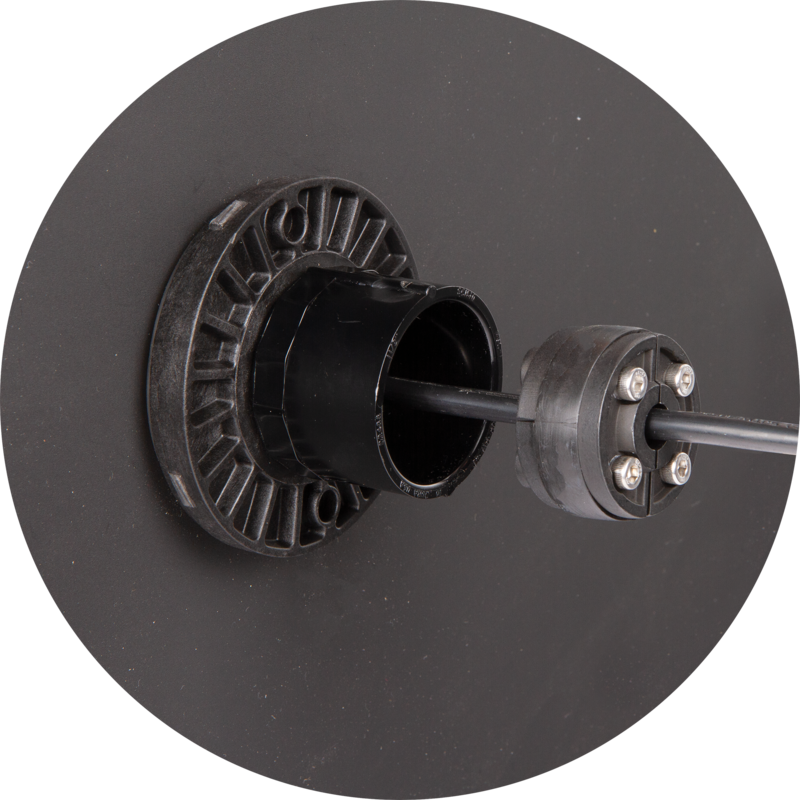 The time these features take varies by size and complexity, with the most complicated installs requiring excavation behind the wall to pass the tubing and perhaps core drilling two or three 2″ holes for Wall Spouts, but they usually take a day or less for a two man crew regardless. The outlay costs are modest. Even the large 36” Colorfalls or Spillway with the 36” Basin Kit runs less than $1800 MSRP (I assume you know your multiplier) plus 1.5-2 man days. With the going rate at around $4000-$5000 for the completed project in most markets, electrical service not included, this is a moneymaker. If you chose wisely, there will be no question about how or when you get paid, just smiling faces all around. Not a bad day’s work, all things considered, especially off-season. 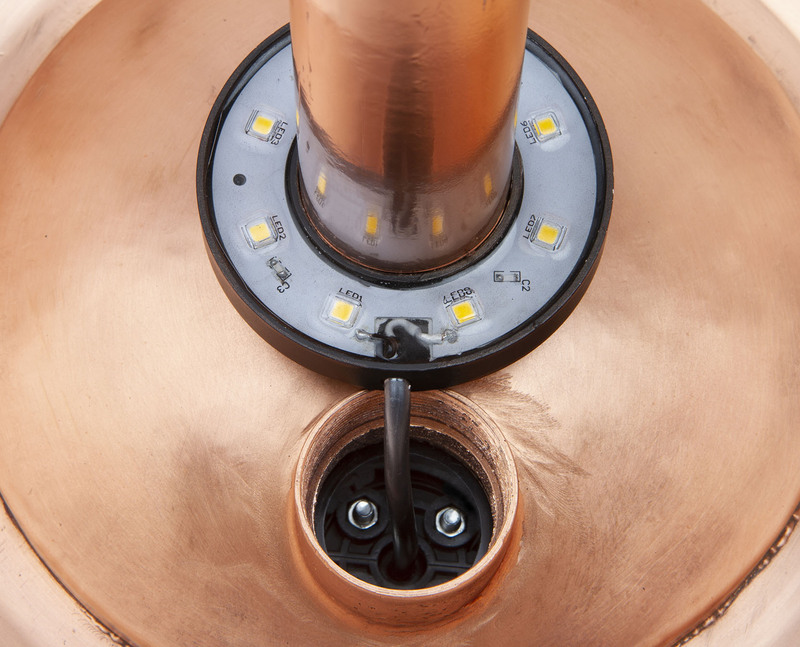 And we’ve haven’t even begun to talk Lighting, the other great add-on – that’s for next time. Meanwhile, get out there and start mining!